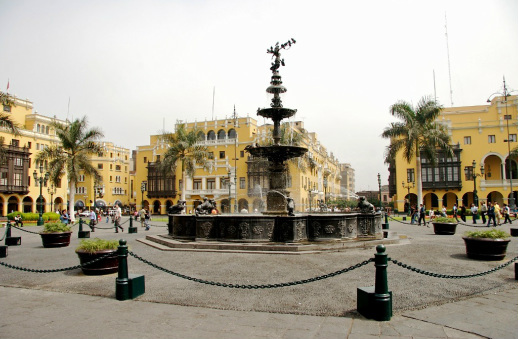 An educational tour of Lima narrated by anthropologist Manuel Arboleda G.
Take a five-hour tour of monumental Lima and enjoy its rich cultural heritage dating back to some 2,500 years. We begin by exploring the sea-side district of Miraflores, Lima trendiest suburb. Perched on bluffs overlooking the sea, Miraflores, with its numerous parks, trendy restaurants, fashionable boutiques and cafes, makes it a great place to start our tour. Step back in time as we stop briefly to see Miraflores’ 2,200 year-old Pucllana pyramid, the site of enigmatic rituals calling for the decapitation of humans to appease the Andean gods. Proceed to San Isidro, the financial nerve of the nation, and enjoy a stroll by the serene four-hundred year old olive groves, home to a dozen species of birds. Then proceed to the historical outskirts of the city and enjoy the modern round-about and stately monuments depicting the various heroes of the battles that mar Peruvian history. To think that the proceeds that financed most of these monuments, parks, and mansions that dot the outskirts of the city came largely from exporting guano (bird dropping)! Right before we enter the historic quarter of Lima, we will swing by the charming Plaza San Martin, the site of the centennial celebrations marking Peruvian independence (1824). Soon we will be at the historical heart of the city and its centre piece, the Plaza Mayor. The stately square, flanked by numerous civic and religious buildings (eg., the splendid archbishop palace with its stunning baroque balconies), is the starting point of our walking tour. A tour that will take you to the banks of the Rimac River to see the 17th century wall that once lined Lima and protected it from thugs and foreign pirates. On the way, we will pass by the beautifully restored 16th century convent of San Francisco and by the ancestral home of Sr. Aliaga, a personal friend of Pizarro who participated in the invasion and was awarded a lot--in which he built his 16th century mansion. Seventeen generations later, the house is still owned and occupied by the same family! We terminate our tour by visiting Rimac, Lima’s oldest quarter and the former playground of Viceroy Amat, and his concubine, “La Perricholi.” His love for her prompted an architectural frenzy that resulted in the renovation and creation of various Alamedas (shaded walkways lined with trees and sculptures) We then drive by Acho, the oldest bull-ring in the Americas, before stopping for a guided visit of the renowned Franciscan Convent of Los Descalzos. The beautifully restored convent, home to a treasure-trove of books, paintings and sculptures, also include, among other facilities, a tiered library, a pharmacy and four cloisters connected with passage ways accented with religious art. This is a tour you do not want to miss! Bird dung and the rise of monumental Lima is a private tour narrated by anthropologists Manuel Arboleda G. The comprehensive tour covers the colonial sections of Lima; old Rimac; trendy Miraflores and San Isidro and points in between. Moreover, the five-hour tour is all-inclusive; it includes all of the transportation, entrance fees and gratuities. 02-03 people, $ TBA USD per-person (in a sedan). 04-10 people, $ TBA USD per-person (in a van). 11-16 people, $ TBA USD per-person (in a sprinter).